Edition of 1308 of which 100 copies are signed 1-100, 26 copies are signed A-Z as artist's proofs, three sets are signed as progressives and 2 are signed as dedication copies. I'm told on good authority that your body completely renews itself-or if not precisely renews, at least replaces all the old parts with different parts-every seven years. So for three times seven years I've been greeting friends and lovers, doing business and taking my ease over food and wine or just confabulating over a cheerful pint after work. Triumphs and disasters, love and loss, lean times and fat, one day rolls into the next and one fine morning you wake up and three times seven full round years have rolled over your head, burying you fathoms deep in memory and good times gone past, and friends here and friends absent. My body has completely replaced itself three times over since Chez Panisse first welcomed me in for dinner. 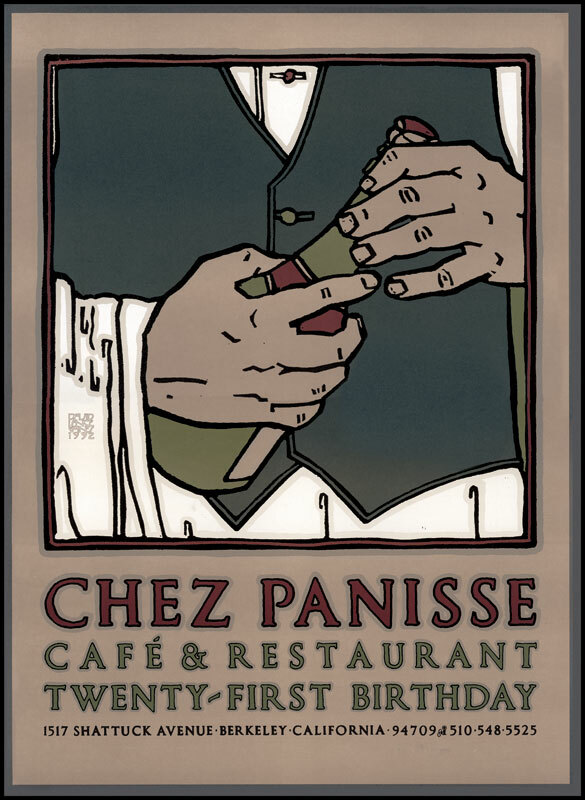 If you are what you eat, I'm Chez Panisse.